After surviving the ""Year of Humiliating Events (YOHE)"" in Click Here (To Find Out How I Survived Seventh Grade), Erin Swift, Web site-designer extraordinaire, is ready to make a fresh start. But in eighth grade, she faces a new set of boy problems, trouble with friends and a painful loss that makes her rethink her priorities. 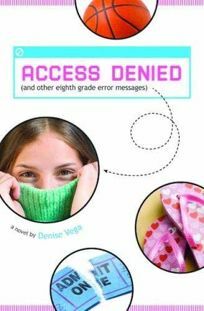 Clearly in tune with adolescents&apos; roller coaster emotions and their numerous challenges, Vega&apos;s sequel is accented with excerpts from Erin&apos;s ""new and improved, totally secret & private home page"" that convey her triumphs and anxieties. Erin&apos;s on-again, off-again crushes-especially with basketball buddy Mark-are entertaining; her more complex relationships with aging custodian, Mr. Foslowski and new student, Reede, who does ""a lot of things against the rules,"" add depth. As before, Erin proves to be a good girl who sometimes finds herself in awkward situations. Accurately mirroring middle-school life, the story should hit home with tweens. Ages 12-up.